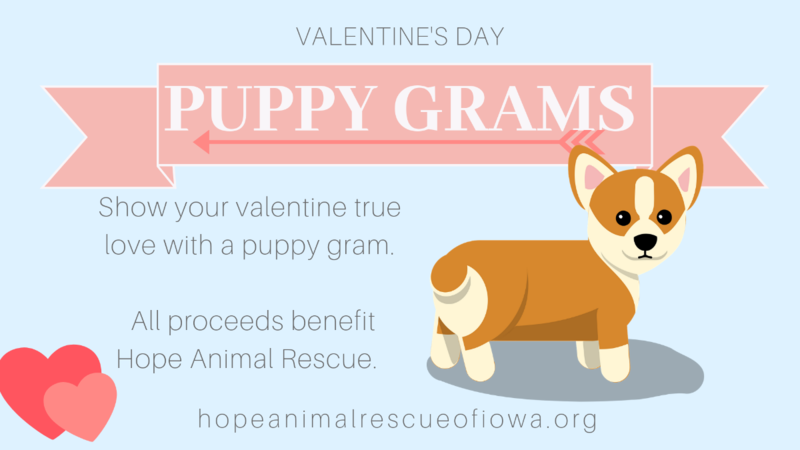 All Valentine Puppy Gram must be within a 20 minute drive of Des Moines area to the recipient’s workplace/location. We’ll also need confirmation that it’s A-OK for a puppy to come inside your Valentine’s workplace/location. Puppy Grams will be scheduled for a 15-minute session between 9 am and 2pm on Thursday, February 14, 2019 and you must make sure the recipient will be there. We’ll bring all the supplies. Enjoy the best Valentine’s Day gift ever! Not only are you gifting puppy breath – you’re supporting the homeless pets counting on Hope Animal Rescue of Iowa. Note: 3% Credit Card fee will be added to total. Purchase one of 30 Puppy Grams by Monday, February 11th – it’s first come, first served. These unique and priceless deliveries are $75 each and all proceeds support the pets served by Hope Animal Rescue of Iowa. You’ll be thoughtful AND philanthropic – the perfect Valentine! On Thursday, February 14, a Hope Animal Rescue of Iowa puppy expert will show up at your sweetheart’s workplace/home with an adorable fluff ball. The recipient gets 15 minutes to play, snuggle, post selfies (#Puppygrams), and play some more. It will be a love fest their friends will envy!